On this page, you will find all there is to know about the Software updates for Super Smash Bros. 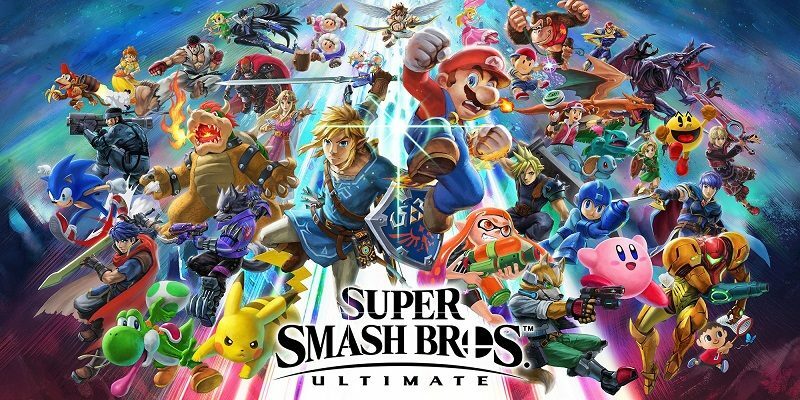 Ultimate on Nintendo Switch (originally released on December 7th 2018 in Europe, North America, and Japan). If you’re looking about details about the DLC (contents, schedule), please check out this page instead! And for the Events and Content Updates, click here! Stage Builder added to Games & More. You can now draw your own custom stages by hand. Note: Camera controls are not available when converting a replay that contains a custom stage into a video. Edit Video feature added to Vault → Replays. You can now create new movies using several videos made from replays. Note: Only videos from Ver. 3.0.0 or later can be used as source material. There are planned expansions to the Edit Video feature in future updates. DLC Spirits option added to the Spirits menu. Note: DLC spirits can only be used if you have purchased the corresponding downloadable content. You can now share replays, videos, Mii Fighters and custom stages with people around the world in Shared Content. Note: You can only post replays and videos created with Ver. 3.0.0 and on. You cannot post replays of online/local wireless battles on custom stages, or videos that include custom stages. You can now sync your game with Smash World, a service accessible via the Nintendo Switch Online smart device app. Available features include viewing some of the things posted to Shared Content, and creating spirit teams from the spirits you have collected. Note: The Smash World service is planned to begin after the distribution of Ver. 3.0.0. If you still don’t see Smash World in your list of services, please try again later. It is now easier to be matched with players who have a similar Global Smash Power in Quickplay. Further improvements and adjustments to matchmaking are planned. You cannot make videos of replays that contain DLC you have not purchased (fighters, stages, music, Mii Fighter costumes, etc.). Game-balance adjustments have been made. Several issues have been fixed to improve gameplay experience. All Fighters Basic Movement Perfect shields will no longer activate multiple times when the shield button is released once. This was creating more downtime than a single perfect shield. All Fighters Basic Movement Made it easier to be penalized for continuous dodging. All Fighters Basic Movement Shortened the downtime when performing a perfect shield against projectiles. Bayonetta Neutral Special Reduced the power against shields. Bowser Up Special Made it so opponents cannot break their fall when continuously hit on the ground. Bowser Jr. Neutral Attack 2 Increased the amount of time opponents will be in the damage animation when the move hits. Charizard Side Special Increased the downward attack range when used on the ground. Chrom Dash Grab Increased grab range. Cloud Neutral Special Reduced the normal shockwave’s power against shields. Corrin Neutral Special Extended the time that uncharged shots last. Corrin Up Smash Attack Increased the attack range of the high-damage tip area. Increased the amount of time hit detection lasts. Corrin Up Special Increased the speed of the invincibility timing. Made it easier to hit multiple times. Corrin Side Smash Attack Made it easier to hit multiple times after releasing the button when charging a smash attack. Corrin Down Air Attack Made it easier to hit multiple times against lightweight opponents. Corrin Side Special Reduced the amount of time necessary to take the next action after stabbing. Daisy Final Smash & FS Meter Reduced the amount of time opponents sleep. Daisy Down Special The launch distance when hitting an opponent with a vegetable now matches Peach. Reduced the vegetable’s power against shields. Daisy Neutral Special When used continuously in the air, fall speed will not decrease after the first use. Dark Pit Neutral Special Reduced the power against shields. Diddy Kong Down Smash Attack Extended launch distance. Diddy Kong Up Air Attack Increased attack power and maintained launch distance. Diddy Kong Neutral Air Attack Increased attack range. Diddy Kong Dash Attack Increased attack speed. Diddy Kong Side Tilt Attack Increased the amount of time hit detection lasts. Donkey Kong Neutral Special Increased the attack range. Dr. Mario Final Smash & FS Meter At the start of the move, nearby opponents will be slowed more and slowed longer. Dr. Mario Neutral Special Reduced the power against shields. Duck Hunt Neutral Special Reduced the power against shields. Duck Hunt Side Special Reduced the power against shields. Ganondorf Other Changed the posture when receiving damage in the air and made it easier to receive damage. Greninja Neutral Special Reduced the power against shields. Ice Climbers FS Meter Extended launch distance. Inkling Side Special Shortened launch distance for the attack when accelerating again. Isabelle Back Air Attack Reduced the power against shields. Isabelle Forward Air Attack Reduced the power against shields. Ivysaur Side Special Reduced the power against shields. Jigglypuff Final Smash & FS Meter Made it easier to push opponents while big. Ken Edge Attack Shortened hitstun time. King Dedede Side Special Reduced the power against shields. King K. Rool Forward Air Attack Increased the high-damage range. King K. Rool Side Tilt Attack Increased the high-damage range. King K. Rool Up Throw No longer affected by the wind while throwing. King K. Rool Side Special Reduced the power against shields. King K. Rool Down Special Reduced vulnerability when the counter succeeds. Reduced vulnerability when the counter fails. King K. Rool Up Air Attack Reduced vulnerability. Kirby Up Smash Attack Extended the high-damage window. Reduced the low-damage window. Kirby Downward Throw Increased power. Kirby Neutral Special Increased the amount of time that Copy Abilities cannot be lost by taking damage, and made it easier for Kirby to retain Copy Abilities overall. Kirby Up Special Increased the speed of the edge-grab range detection. Kirby Neutral Air Attack Reduced vulnerability. Shortened landing time after using the move. Link Side Special Reduced the power against shields. Lucario Neutral Special Reduced the power against shields. Lucina Dash Grab Increased grab range. Luigi Neutral Special Reduced the power against shields. Mario Final Smash & FS Meter At the start of the move, nearby opponents will be slowed more and slowed longer. Mario Neutral Special Reduced the power against shields. Marth Dash Grab Increased grab range. Mega Man Up Smash Attack Extended launch distance. Mega Man Down Special Reduced attack speed. Throwing-type items can no longer be thrown while using Leaf Shield. Mega Man Neutral Air Attack Reduced the power against shields. Mega Man Neutral Attack 1 Reduced the power against shields. Mega Man Neutral Special Reduced the power against shields. Mega Man Side Tilt Attack Reduced the power against shields. Mewtwo Edge Dodge Extended invincibility time. Mewtwo Neutral Special Extended launch distance. Reduced the power against shields. Mewtwo Side Tilt Attack Increased attack power and maintained launch distance. Mewtwo Up Air Attack Increased attack power and maintained launch distance. Mewtwo Up Tilt Attack Increased attack power and maintained launch distance. Adjusted launch angle when hit by the tip of the tail. Mewtwo Edge Attack Increased attack range. Mewtwo Side Smash Attack Increased attack range. Mewtwo Neutral Attack 1 Increased attack speed. Mewtwo Basic Movement Increased the fighter’s weight. Mii Gunner Down Special 2 Reduced the power against shields. Mii Gunner Neutral Special 1 Reduced the power against shields. Mii Gunner Neutral Special 3 Reduced the power against shields. Mii Gunner Side Special 1 Reduced the power against shields. Mii Gunner Side Special 3 Reduced the power against shields. Mii Swordfighter Edge Attack Increased attack range. Mii Swordfighter Neutral Special 1 Reduced the power against shields. Mii Swordfighter Neutral Special 2 Reduced the power against shields. Mii Swordfighter Side Special 3 Reduced the power against shields. Mr. Game & Watch Final Smash & FS Meter Increased the amount of time opponents are trapped. Ness Neutral Special Increased the attack range. Ness Down Smash Attack Shortened the charge time. Reduced the amount of time hit detection lasts while charging. Ness Up Smash Attack Shortened the charge time. Olimar Side Special Reduced the power against shields. Olimar Side Smash Attack Reduced the power against shields. The power will now properly increase when charged. Olimar Down Smash Attack The power will now properly increase when charged. Olimar Up Smash Attack The power will now properly increase when charged. PAC-MAN Down Special Increased the downward attack range of the fire hydrant while its falling. PAC-MAN Neutral Special Reduced the power against shields. Palutena Neutral Special Reduced the power against shields. Palutena Side Special Reduced the power against shields. Peach Down Special Reduced the vegetable’s power against shields. Peach Final Smash & FS Meter Reduced the amount of time opponents sleep. Peach Neutral Special When used continuously in the air, fall speed will not decrease after the first use. Pichu Other Changed the posture when receiving damage in the air and made it easier to receive damage. Changed the posture when landing and made it easier to receive damage. Pichu Neutral Special Reduced the power against shields. Pikachu Neutral Special Reduced the power against shields. Piranha Plant Neutral Special Increased attack range for the spiked ball. Piranha Plant Edge Attack Increased attack range. Pit Neutral Special Reduced the power against shields. R.O.B. Down Special Reduced the power against shields. R.O.B. Neutral Special Reduced the power against shields. Richter Edge Attack Increased attack range. Richter Side Special Reduced the power against shields. Ridley Final Smash & FS Meter Once the move ends, Ridley can now move earlier than opponents. Ridley Neutral Special Reduced the power against shields. Robin Side Special Reduced the power against shields. Robin Neutral Special Reduced Thunder/Elthunder’s power against shields. Rosalina & Luma Final Smash & FS Meter At the start of the move, nearby opponents will be slowed more and slowed longer. Rosalina & Luma Down Tilt Attack If Luma is close, Luma will move in front of Rosalina when attacking in the opposite direction. Rosalina & Luma Side Tilt Attack If Luma is close, Luma will move in front of Rosalina when attacking in the opposite direction. Rosalina & Luma Neutral Special Reduced the power against shields. Rosalina & Luma Side Special Reduced the power against shields. Roy Dash Grab Increased grab range. Roy Up Special Made it easier to hit multiple times. Ryu Edge Attack Shortened hitstun time. Samus Neutral Special Reduced the power against shields. Sheik Forward Air Attack Increased the attack range. Sheik Down Tilt Attack Made it easier to hit with the tip of the attack. Sheik Flurry Attack Finish Reduced vulnerability. Sheik Neutral Special Shortened the charge time. Shulk Edge Attack Increased attack range. Shulk Get-Up Attack Increased attack range. Simon Edge Attack Increased attack range. Simon Side Special Reduced the power against shields. Snake Back Air Attack Extended launch distance when hit in the high-damage range. Snake Up Smash Attack Increased vulnerability. Snake Side Special Reduced the attack range of airborne missiles. Snake Neutral Special Reduced the power against shields. Sonic Final Smash Increased attack range. Sonic FS Meter Increased attack range. Toon Link Side Special Reduced the power against shields. Villager Back Air Attack Reduced the power against shields. Villager Forward Air Attack Reduced the power against shields. Villager Side Special Reduced the power against shields. Wario Neutral Special Made it easier to eat projectiles. Wii Fit Trainer Neutral Attack 3 Increased bury range. Wii Fit Trainer Down Special Increased the amount of time the effect lasts when successful. Wii Fit Trainer Neutral Special Reduced the power against shields. Wii Fit Trainer Side Special Reduced the power against shields. Changed the location of the ball spawn when touching terrain. Wolf Neutral Special Reduced the power against shields. Wolf Down Smash Attack Shortened the launch distance of the forward attack. Yoshi Up Special Reduced the power against shields. Young Link Neutral Special Reduced the power against shields. Young Link Side Special Reduced the power against shields. Zelda Down Special Reduced the power against shields. adds new Stage Builder mode: Create your own original stages and then play on them. adds new Video Editor mode: Combine video clips into new videos. adds new Shared Content mode: Browse videos and stages posted by other players around the world! enables Smash World, a new addition to the Nintendo Switch Online smartphone app. Additional notes: update announced on February 13th. More details can be found in this post! Update is required in order to play online, and via local wireless with players who have already updated to Ver. 3.0.0. Replays created with Ver. 2.0.2 and earlier are not compatible with this version of the game. Additional notes: update is required in order to play online, and via local wireless with players who have already updated to Ver. 2.0.2. Replays created with Ver. 1.2.1 and earlier are not compatible with this version of the game. A bug in Ver. 2.0.0 where the King K. Rool Challenge in the Adventure section of Challenges wouldn’t clear, even after fulfilling the conditions, has been fixed. If you have experienced the bug, please reload your Adventure save data. After that, return to the main menu and the King K. Rool Challenge will clear. Additional notes: update is required in order to play online, and via local wireless with players who have already updated to Ver. 2.0.1. Replays created with Ver. 1.2.1 and earlier are not compatible with this version of the game. Additional notes: update is required in order to play online, and via local wireless with players who have already updated to Ver. 2.0.0. Replays created with Ver. 1.2.1 and earlier are not compatible with this version of the game. Additional notes: update is required in order to play online, and via local wireless with players who have already updated to Ver. 1.2.1. Replays created with Ver. 1.2.0 are compatible with this version of the game. Adjusted difficulty of approaching challengers. When matchmaking in Quickplay, the Format setting of your Preferred Rules will be prioritized more. This may cause matchmaking to take more time. Also, there is no guarantee that matchmaking will be done exactly as shown in the set Preferred Rules. Increased the stability of the synchronous connection within Battle Arenas. Additional notes: replays created with Ver. 1.1.0 or earlier will not be compatible with this version. Make sure to convert them to video before downloading the update! Additional notes: this is the Day 1 update for the game. Additional notes: this is the launch version of the game, and the one you get if you pre-purchase the game on the Nintendo eShop. 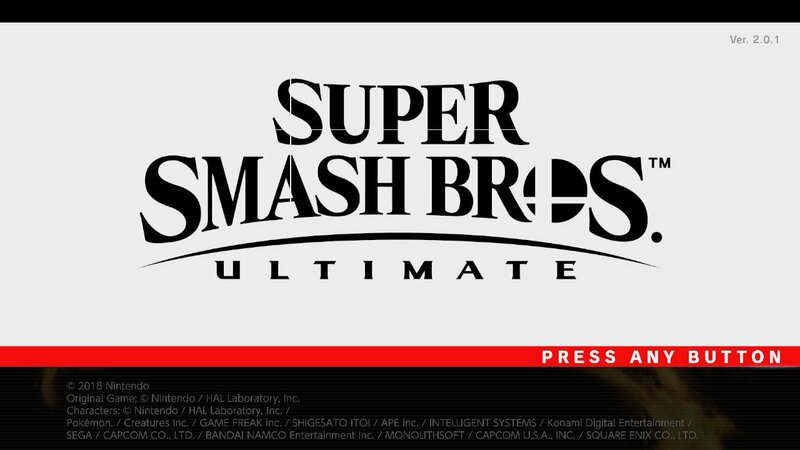 How to download updates for Super Smash Bros. Ultimate for the Nintendo Switch? To check that you have the latest version installed, simply select the game on the Home Menu, and press – or + to go to the Options: the version number is displayed just below the game title. Alternatively, you can launch the game: the version number is displayed in the top right corner of the screen.